“22 Jump Street” is so meta-meta-META about being a dopey summer sequel that its best gags detonate like delayed-response fireworks: The audience giggles at the initial ka-boom only to laugh harder and weirder as different colors and meanings become apparent. The comedy’s final moments even serve as a pyrotechnic grand finale, the filmmakers lighting all the leftover rockets and running for cover as the end credits run. Sensibly, we’re first offered a few scenes from a purported sequel to the sequel: “23 Jump Street: Medical School.” It looks exactly like the movie we’ve just watched, only in scrubs. Then, though, directors Phil Lord and Christopher Miller keep going, as if helplessly in thrall to the Hollywood moneymaking machinery: “24 Jump Street: Foreign Exchange” (the better to capture the Russian market), “25 Jump Street: Semester at Sea,” “26 Jump Street: Art School,” “27 Jump Street: Culinary School.” By “28 Jump Street: Veterinary School,” costar Jonah Hill has been replaced by another actor, but we’re assured that no one will notice. By “33 Jump Street: Generations,” we’re down to the inevitable tie-in with the original TV show and an appearance by down-on-his-luck former star Richard Grieco. And still the machine keeps grinding: “35 Jump Street: Traffic School,” “37 Jump Street: Scuba Class,” “40 Jump Street: Retirement Home.” One of the sequels is a video game, one only features action figures, I think one takes place on a lunchbox. They all come barreling at us with the same breathless, must-see media sell that follows us everywhere — on our TVs, our laptops, our cellphones, and now as part of the movie itself. These make-believe “Jump Street” sequels are purely fractal — replicants, identical twins, clones — and instead of offering fresh ideas or story lines, they parody our comfort with predictability. Would we really pay for the same jokes, just with different nouns and verbs? Of course we would, and do. An entire entertainment culture reaps immense profits from that notion. That’s why the grand finale of “22 Jump Street” is both hilarious and horrifying — a condemnation of our proclivity toward regurgitated swill and a celebration of it, too. And still the joke’s not complete. That will be when “23 Jump Street: Medical School” — or some variation thereof — hits theaters for real and we all line up to see it. 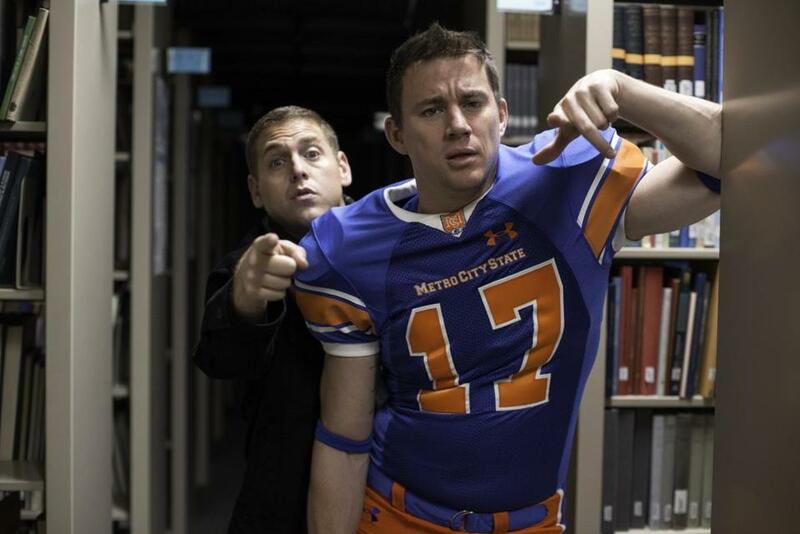 “22 Jump Street” is overloaded with laughs, but the last one is most assuredly on us.